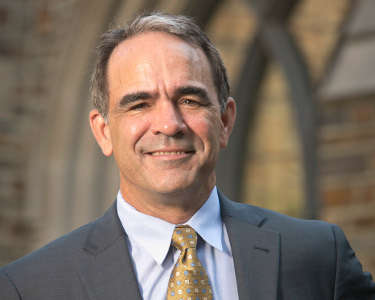 Brian Murray is the director of the Duke University Energy Initiative. Murray is widely recognized for his work on the economics of energy policy, particularly as it relates to efforts to mitigate climate change risk. This includes the design and assessment of market-based instruments such as carbon tax, cap-and-trade, and tradable performance standards, as well as policies affecting the markets for bioenergy and other renewables. Murray is among the original designers of the allowance price reserve approach for containing prices in carbon markets that was adopted by California and the Regional Greenhouse Gas Initiative (RGGI) cap-and-trade programs and served on a National Academy of Science panel to examine the effects of the U.S. federal tax code on energy-related greenhouse gas emissions. Throughout his 25-year research career, Murray has produced many peer-reviewed publications on topics ranging from the design of market-based environmental policies and the effectiveness of renewable energy subsidies to the evaluation of programs to protect natural habitats such as forests, coastal and marine ecosystems. Murray is a research professor at the Nicholas School of the Environment and a faculty affiliate with the Nicholas Institute for Environmental Policy Solutions, where he previously served as Director of the Environmental Economics Program. Murray also serves as a faculty affiliate with the Duke Initiative for Science and Society. Murray is a regular contributor to Forbes. You can follow him on Twitter at @murraybrianc.